This award-winning joker has spent two decades chronicling the political ascendancy of Latinos in America and pushing the boundaries of Chicano art. He is the creator of the first nationally syndicated, politically themed Latino daily comic strip, La Cucaracha; he co-founded the political comedy troupe Chicano Secret Service; and he co-hosts the infamous Pocho Hour of Power on KPFK in Los Angeles (90.7 FM). Alcaraz won the So Cal Press Club Award for Best Editorial Cartoons in 2010. He now teaches at Otis College of Art & Design in Los Angeles. Rumor has it he was actually born here. 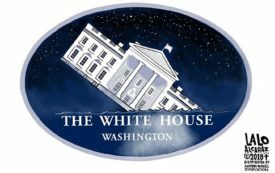 When will this sinking ship hit bottom?